Woolen products, related from the individual squares, and can become a worthy decoration of the interior. 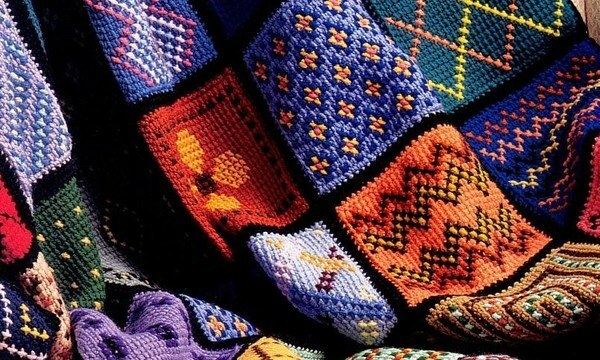 Colorful geometric shapes can be joined in a quilt or blanket. Openwork squares connected by spokes of thin yarn, can transform into curtains or a tablecloth. Do the preparatory work, to more accurately associate the square spokes. Dial on the spokes 25 of the loops and provarite garter viscous 25-30 rows. If the product will consist of openwork squares, tie knitting a sample pattern according to the prepared scheme. In heavy cardboard, cut a square 10 × 10 cm Secure on the table linked sample, but make sure that it is not deformed. Put the window on the canvas and align the borders of the square by rows of knitting. Count how many loops make up the width of the square. Also count how many rows you have to execute in height. Record your measurements. If you decide to knit squares spokes, the sides of which is equal to 10 centimeters, use the available data of the number of loops and rows. In that case, if the sizes of the figures differ, just calculate how much you will need to dial loops and link rows to one square. In the process of knitting squares spokes , check the geometric shapes. To do this, fold the piece diagonally and see whether the length of the sides. Adjust the square as necessary. Knit squares from yarn of the same thickness, but different in color. When you use a completely different yarn, density of knitting will be different, so in this case, calculate the number of stitches and rows for each type of thread. Finished parts spread out on a flat surface. You can collect a blanket from the related squares in random order or in strict compliance with the ornament. Connect the fragments together with pins or baste the parts. Join the parts knitted stitch. You can also use a hook and tie the squares between columns without nakida. Make blankets for the lining, for instance fleece. Curtains and tablecloth, made of openwork squares, necromante and well athlete.